The Faux Earnings Growth Game | Energy and Gold Ltd. In 2008 GAAP earnings were less than 50% of the so called non-GAAP “adjusted” earnings numbers for the S&P 500. The interesting aspect of the above chart is that the year before the last two market peaks (1999 and 2006) also coincided with the largest GAAP EPS percentage of non-GAAP EPS. After all this makes sense, when times are good companies don’t have any need to take goodwill impairments or restructuring charges etc. This begs the question, what’s happening now? 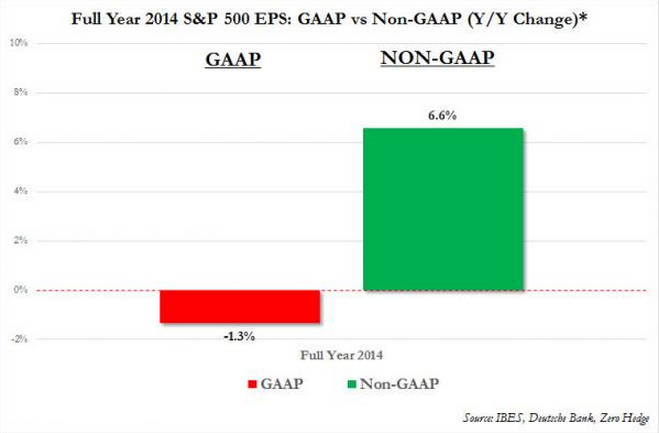 In 2014 S&P 500 GAAP EPS was $102/share while non-GAAP EPS was $118/share. We are 5 years removed from a recession and the stock market is roaring so why the large disparity between GAAP earnings and non-GAAP earnings?